Oil/water separators are used to ensure that ships do not discharge oil when pumping out bilges, oil tanks or any oil-contaminated space. International legislation relating to oil pollution is becoming more and more stringent in the limits set for oil discharge. The oily water separator (OWS) is a very important piece of equipment carried on board. It is used to ensure that water is discharged overboard within legal limits. The OWS must be maintained in full working order and operated according to MARPOL regulations. Officers using the equipment must be fully familiar with how it operates. The OWS is frequently inspected at port state inspections. There should also be an OWS operation manual on board and relevant staff should be familiar with the manual and should have practised with the equipment. Please refer to MARPOL Annex 1 and Marlins Course: Oily Water Separators for more information. Clean water suitable for discharge is defined as that containing less than 15 parts per million of oil. Oil/water separators using the gravity system can only achieve 100 parts per million and must therefore be used in conjunction with some form of filter. Oily water separator, bilge water separator – A device used to separate oil from oily water mixtures and from the emulsion. Bilge separators are necessary aboard vessels to prevent discharge of oil overboard while pumping out bilges or while cleaning oil tanks. An oilcontent monitor is provided to measure continuously the oil content of the effluent. 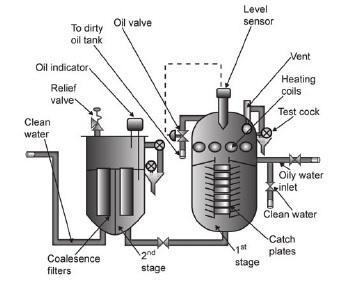 If the set limit of the oil content is exceeded, the effluent is automatically recirculated to the collecting tank, or the separator is stopped. Many conventional oily water separators fail to split stable emulsions and remove suspended colloidal particles from the water phase. This often results in equipment malfunction because the separation of oil below 15 ppm is not achieved or because of clogging from excessive solids. 15 ppm bilge separator – Any combination of a separator, a coalescer or other means, and also a single unit designed to produce an effluent with oil content not exceeding 15 parts of oil per million parts of water by volume. Note: According to Resolution MEPC.107(49), a sampling point should be provided in a vertical section of the water effluent piping as close as practicable to the 15 ppm bilge separator. Re-circulating facilities should be provided after and adjacent to the overboard outlet of the stopping device to enable the 15 ppm bilge separator system, including the 15 ppm bilge alarm and the automatic stopping device, to be tested with the overboard discharge closed. One of the main causes of oilywater filtering equipment malfunction is the effect of bilge water containing cleaning agents. Detergent-based cleaning fluids can produce chemically stabilised oil emulsions which cannot be separated on board ship by the gravity alone. The best way to improve the performance of oily bilge water separating equipment is to avoid the use of surfactant-based cleaning materials. A complete oil/water separator and filter unit for 15 parts per million purity is shown in Figure . The complete unit is first filled with clean water; the oily water mixture is then pumped through the separator inlet pipe into the coarse separating compartment. Here some oil, as a result of its lower density, will separate and rise into the oil collection space. The remaining oil/water mixture now flows down into the fine separating compartment and moves slowly between the catch plates. 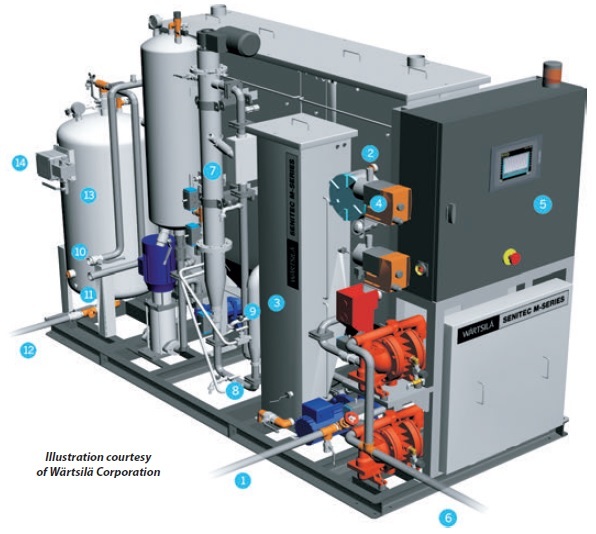 The Wärtsilä Senitec oily water treatment units use optimized emulsion breaking and separation technology that surpasses all existing regulations and guarantees an oil content in the cleaned water of below 5 ppm. In normal operation the actual levels have repeatedly been shown to be as low as 1 ppm, which gives a priceless safety margin to the IMO limit. More oil will separate out onto the underside of these plates and travel outwards until it is free to rise into the oil collecting space. The almost oil-free water passes into the central pipe and leaves the separator unit. The purity at this point will be 100 parts per million or less. An automatically controlled valve releases the separated oil to a storage tank. Air is released from the unit by a vent valve. Steam or electric heating coils are provided in the upper and sometimes the lower parts of the separator, depending upon the type of oil to be separated. Where greater purity is required, the almost oil-free water passes to a filter unit. The water flows in turn through two filter stages and the oil removed passes to oil collecting spaces. The first-stage filter removes physical impurities present and promotes some fine separation. The second-stage filter uses coalescer inserts to achieve the final de-oiling. Coalescence is the breakdown of surface tension between oil droplets in an oil/water mixture which causes them to join and increase in size. The oil from the collecting spaces is drained away manually, as required, usually about once a week. The filter inserts will require changing, the period of useful life depending upon the operating conditions. Current legislation requires the use of a monitoring unit which continuously records and gives an alarm when levels of discharge in excess of 15 parts per million occur.